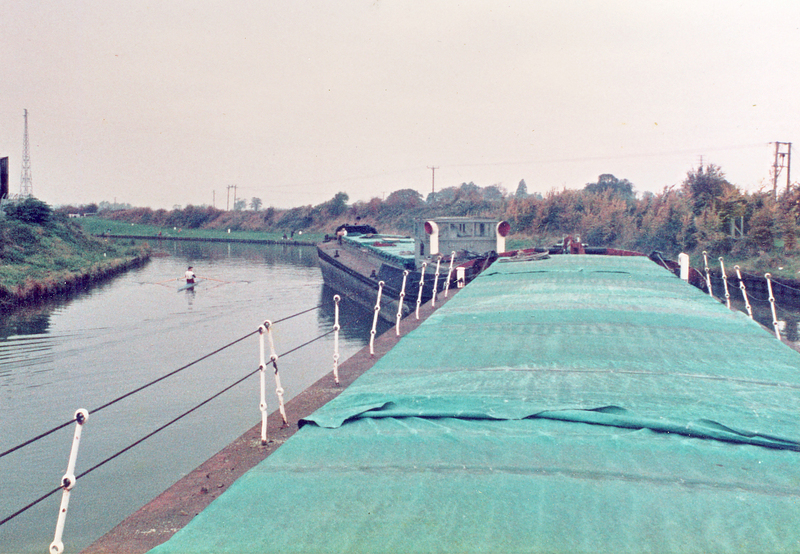 A month after buying the barge, here we were, watching the canal banks slip past and all was well. At least, all was well until the outskirts of Gloucester where, in the middle of a fishing competition, the long neglected engine of the Nancy spluttered and died. There was utter silence, both on the decks of the barges and the banks of the canal, as slowly the boats lost steerage and started to jack-knife across the canal. The silence was suddenly broken by the cries and swearing of the anglers, as first the bows of one barge and then the stern of the other, started to tangle their lines and tear their keep nets out of the bank. But their oaths sounded as innocent as a child’s prayer when compared to the torrents of invective that poured from the mouth of Peter, as he expressed his opinions concerning those that had nothing better to do with their time than sit on their arses, watching a canal all day. As Peter rants, Kate and Mo try to keep straight faces. 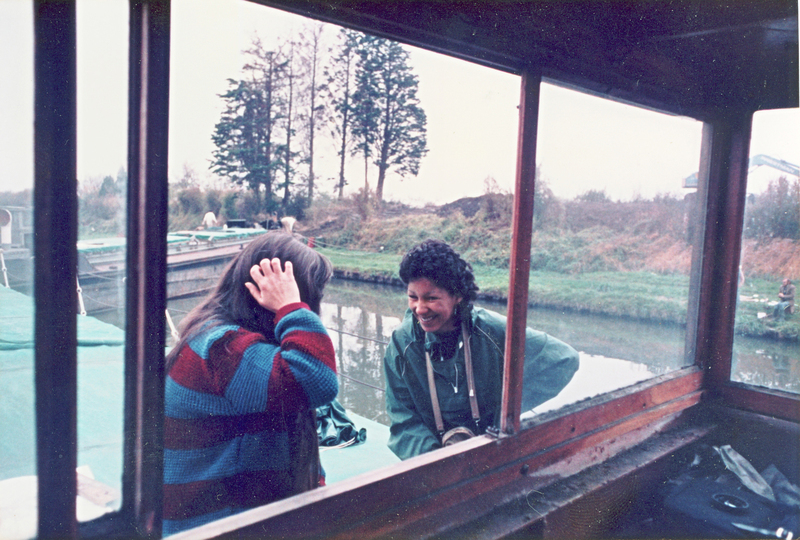 As Peter disappeared down into Nancy’s engine room to sort things out, Kate, ever practical and diplomatic, suggested to the anglers that if they would like to take a line from the bows, they could pull the barges straight and sort out their lines. At this they did a remarkable impression of being deaf: I’m sure some of them actually whistled at the sky! In any case it shut them up, and in a minute or two the engine coughed back into life and we resumed our progress. There is not really that much to tell of the rest of that day, other than it was a day full of dreamy memories of the Gloucestershire countryside, bathed in gentle autumn light for which there are, really, no adequate words. We had one more moment of excitement when, just before Saul Junction, the engine died again and once more, the barges swung across the canal. As the fuel blockage was being cleared, we saw a danger approaching that was far more threatening than angry anglers! One of the tankers which served the oil depot at Quedgley, was approaching at quite a speed. As I went forward to warn Peter, the engine once more spluttered and coughed into life. He emerged from the engine room, cast an eye at the approaching tanker, unhurriedly took the wheel and straightened us out. To me, it seemed like a close thing, for the barges were barely against the bank before the tanker was sweeping past. I was also a little concerned at the thought of locking onto the Severn and making the trip to Avonmouth the following day. But, after a stop for some more maintenance at Saul, the engine did not miss another beat all the way to Sharpness. The afternoon sun was westering as we passed through the swing-bridge at Purton and glided along the final straight stretch of canal before Sharpness. Wide vistas opened up of the Severn which, here, runs alongside the canal. The banks of the river are strewn with the hulks of old barges and coasters, scuttled here at the end of their working lives to help to protect the riverbank from erosion. Halfway down this stretch stand the mournful remains of the old Severn railway bridge, destroyed in the early sixties when a couple of tankers, which had collided in the fog off Sharpness and caught fire, drifted up and destroyed the bridge. After the rural idyll that was the canal, Sharpness came as something of a shock. On a Saturday afternoon in November, the docks were deserted, but apparently, so was the town. It was like a ghost town, not a living soul stirring. We needed a taxi to get us back to Gloucester to retrieve our car and eventually found a telephone box opposite the (closed) Post Office and general store. As luck would have it, a taxi firm had left their card inside. When we got through, we were informed that they only had two cars, one was broken down at the garage and the other was doing a wedding and would not be back until late evening. Next, we found a card in the shop window and tried that number for about an hour – and still there was no reply. This was, of course, long before the advent of talking pages and mobile phones and there were no telephone directories in the call box. We were beginning to wonder if we would end up stranded, when the owner of the post office arrived home. She apologised for not having taken the taxi advert out of the window when the firm had closed down, two years previously. But at least she was able to give us the number of a cab firm in Gloucester, who sent a car to pick us up. November 1983, at last our project was under way, we were the proud owners of 150 tons of rusting steel, but now it was 150 tons of rusting steel which not only floated but moved. Our plan was to turn her into a studio and gallery in Bristol. There were many diverse influences and ideas that had brought us to this point. Long evenings with friends around the campfire, dreaming of narrow boats and a life producing and selling paintings around the waterways was a favourite, but one which always died a death when we faced up to the practical implications of sharing a narrow boat with two teenage sons. Also, I had few illusions as to my ability to provide a consistent income from my painting alone. Eventually our ideas had coalesced into a plan to find a suitable lighter, estuary barge or coaster and secure a mooring in Bristol, where the redevelopment of the city docks was underway. Here we would convert it into a studio and gallery. The gallery would not only give me the means of selling my work but would also supplement my income by selling other artist’s work as well. “This man’s come to buy a boat from me”. I was staggered, I knew no one in Bude and had spoken to nobody of my intentions. I realised that I was dealing with a man who was canny in more than just the ways of the sea. We talked for a while and he showed me over the Wilclair, the barge he had been painting. It was a splendid vessel but I knew that the price would be way out of my range. 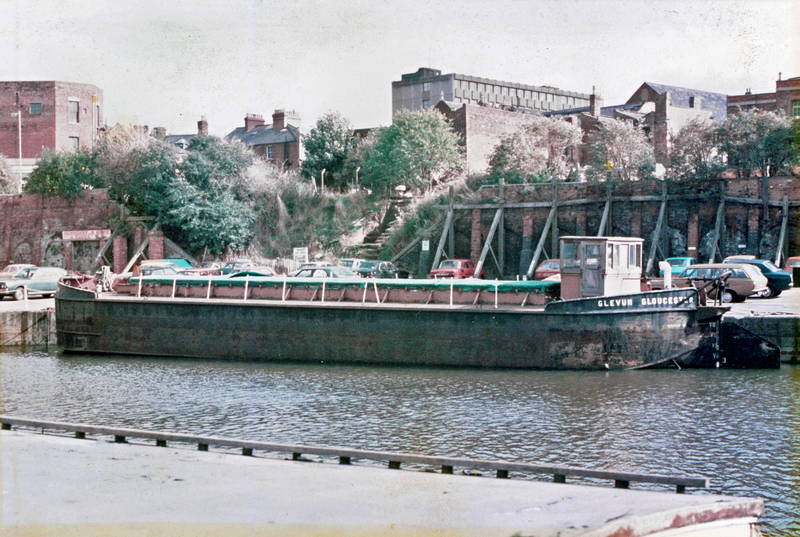 He told me that the barge was built as the Severn Trader in the 1930s by Charles Hill & and Sons in Bristol. He also had a couple of old steam coasters moored on the canal but, when I looked in their holds, they were much to deep and boxlike for my purposes. It seemed that at one time or another, Peter had owned half the coasters that had ever plied the Bristol Channel. He bought them towards the end of their working lives and then made the best living he could from them in their last years. When he realised how passionate was my interest in these ships, we went to his house where he showed me his photograph albums and we chatted for hours, or rather he did. I just listened, entranced. Eventually, pleasure had to give way to business and, as I had suspected, the Wilclair was way beyond my budget. But he then told me of an old grain barge he owned which was lying in Victoria Dock in Gloucester and invited me to look it over and see what I thought. 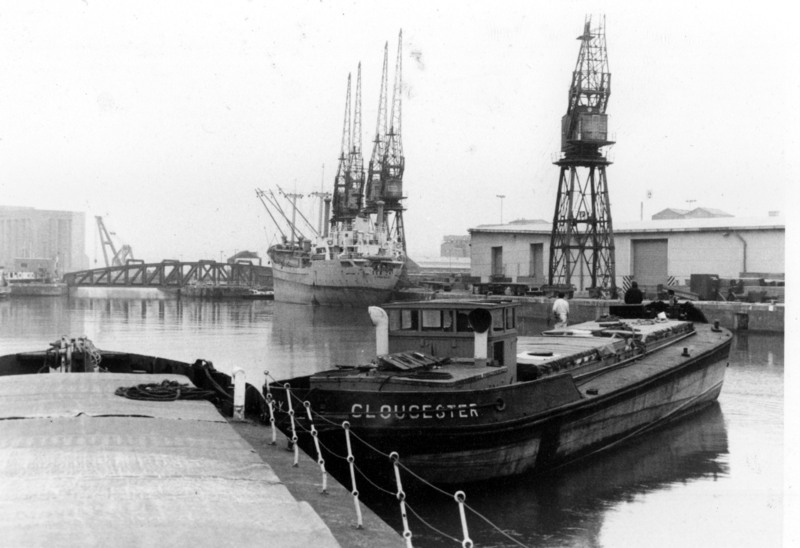 Two days later I was in Gloucester looking at the rusty barge; the outside appearance was not exactly prepossessing but at least it was hatched and had a small wheelhouse. I knocked out some wedges, pulled back the old tarpaulins and removed a couple of hatch boards. Inside a ladder disappeared down into the gloom. I descended into the hold and shone my torch around – it was perfect. The shape of the hold might well have been designed as a gallery! That night we came to a firm decision and I rang Peter. He came to see us later that week and the deal was struck. 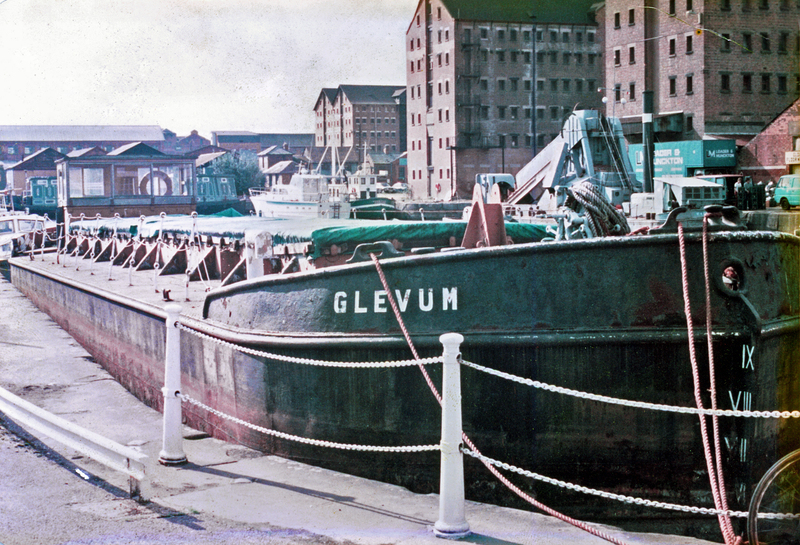 We now owned all sixty-four shares in the grain barge Glevum, still a registered vessel in the British merchant fleet. In 1984, my wife, Kate and I opened a gallery on the grain barge ‘Glevum’ in Bristol City Docks. “An art gallery on a boat? You must be mad!” was the most common reaction when we had told people of our plans. What follows is the story of how it came about. The soft autumn colours were lit by gentle November sunshine as the banks of the Gloucester-Sharpness canal slipped past on either side. We sat on the hatches of the Glevum, a 150ton grain barge, at present being towed by the Nancy, a motor barge of similar dimensions. At the helm of the Nancy was Peter Herbert, a silver haired Cornish skipper and ship owner, who had gone to sea on ketches in the nineteen thirties and had rarely had his feet on dry land for any length of time since. The scene was calm and serene, but this was in complete contrast to our eventful embarkation in Gloucester Docks some fifteen minutes earlier. Part of the deal Kate and I had struck with Peter, when we had bought the Glevum from him a month or so previously, included a tow to Bristol. Peter had bought the Nancy in Gloucester a few weeks earlier and, as the engine had not been run for twelve or more years, there were a few mechanical problems to be sorted out, hence the delay. For weeks we had been awaiting news of when the barges would set out for Bristol. This period of inactivity was, for me, almost unbearable. At last, the previous evening, had come the call I’d been waiting for. There was just one problem, or rather there were three problems. The first was the telephone line, which was appalling. The second was that the phone box from which Peter was calling, appeared to be adjacent to the Gloucester ring road and it was rush hour, the third was Peter’s thick Cornish accent. After bellowing at each other for five minutes, I eventually managed to glean the information that the barges would be leaving Gloucester at a quarter past ten the following morning, Saturday, November 5th 1983. I immediately called our friends John and Mo, as they were to accompany us and made arrangements to pick them up the following morning. “Where’s thee bin? I told ee we wuz sailin at a quarter to ten”. Then he had an idea, “Jump on as we go under the bridge”. I ran back, parked the car and rejoined the others. Kate, having found the nearby dock gates locked, was climbing over them when the bridge keeper came out and started scolding her like a naughty child. He was the archetypical “Jobsworth” and made her get back down (on the wrong side) and refused to unlock the gates for us, forcing us to return to the main entrance (nearly a quarter of a mile) and then back down the road. We saved some time by driving back to the main gates and parking near them. Even so, by the time we had got back to the bridge, the barges were through. Peter brought the Nancy close alongside the quay which, at this point, was only a foot or so above the canal. Glevum, close coupled to Nancy’s stern, obediently followed and as she slowly passed, her deck was some four feet up from the quay. We jumped up one by one, John went first, then Mo. By now the strip of water between the moving side of the barge and the quay was widening so I urged Kate to jump quickly. She wanted me to go so as to be able to catch and help her up onto the deck. There was no time to be lost so I leaped, caught a stanchion and hauled myself aboard. Standing up, I called to Kate to jump but I could see the gap was now at least four feet and with the deck of the barge five feet above the water, it was quite a jump. Kate’s nerve failed her. I pointed out we might not be back till late evening and this stirred her. As someone who had always been terrified of both heights and water it was a stunningly brave act. She sailed across the water and hit the side of the barge full force. Her hands grabbed the gunwale and she got her right foot onto the deck – then it slipped off again and we moved off down the canal with Kate hanging from the bows of the Glevum, her feet only inches from the water. John and I grabbed a wrist each and with a heave, pulled her up to join the rest of us on deck. She was shaken and bruised but there were no bones broken and a cup of steaming coffee from the flask and the November sunshine soon cheered her up.